For this months edition of The Secret Recipe Club, hosted by the lovely Amanda of Amanda's Cookin, I was assigned Jeanie's blog The Tasty Cheapskate, "Hi Jeanie"!!!. Over the last month, I've had so much fun going through this lovely blog and I've found some very interesting recipes that I can see myself making very soon. One recipe that caught my attention and kept coming to mind every now and then, almost menacingly, in a nice way though, were Oma van der Wouden's Dutch Almond Bars. I've never seen or had Dutch Almond Bars before, but I'm quite fond of almonds and these bars looked so amazing, I had to try them. This recipe calls for almond paste and in this part of the world we don't get this stuff off the shelf in stores. I did a little digging online and most sources called for additional sugar, eggs, extracts and so on. I decided to do things a little differently. Since the recipe for these bars seemed to have sufficient sweetness, I simply added some homemade almond paste (details below). The batter came together beautifully and while these bars were baking, I was going nuts with the anticipation (read 'doing a crazy dance all around the kitchen and eagerly peeking through the oven door almost every minute'). The wait and the anticipation was so worth it. These bars are a real treat. They are perfect with a cup of tea or coffee. 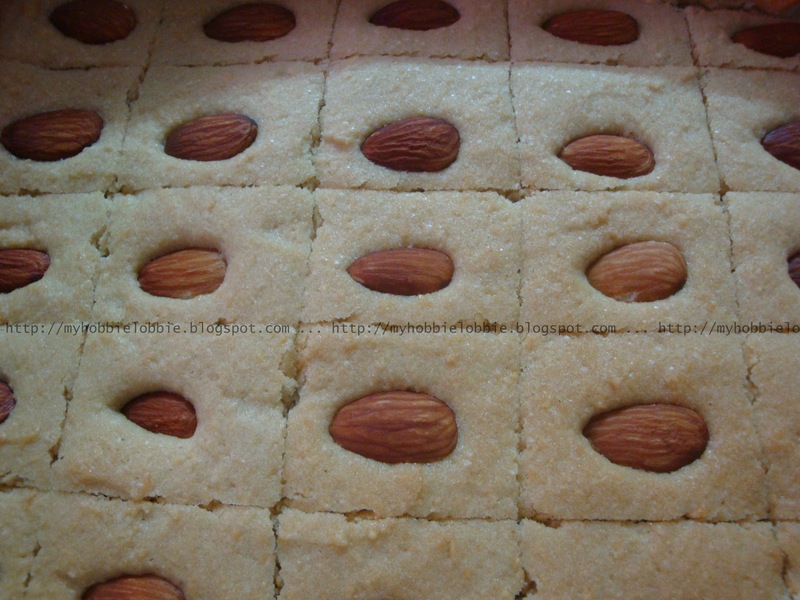 They are not too sweet but have this lovely nutty richness that the butter and the almonds have to offer. They are so wonderfully moreish. Be warned, you won't be able to stop at one. So thank you Jeanie for sharing this lovely treat. This recipe is a definite keeper. Soak the 4 oz. almonds overnight in some water. The next morning, peel the skins off and discard. Grind the almonds to a paste in your food processor. That's it! Its really simple to make your own almond paste. Cream the butter and the almond paste. Add the brown sugar and cream well. Line a 8"x10" cake pan with some foil. Spread the batter in the prepared tin. Press the whole almonds into the batter. Bake at 150ºC for about 40-45 minutes or till it has the slightest brownish pinkish glow. Note: This is half of the recipe mentioned on Jeanie's blog and I managed to get 25 pieces. The original quantities are baked in a 9"x13" tin and yield about 24-36 pieces. So do adjust the size of the bars to suit your liking. Do stop a while and check out what the others have whipped up this month. If you'd like to be a part of The Secret Recipe Club, get in touch with Amanda here and join in on the fun. 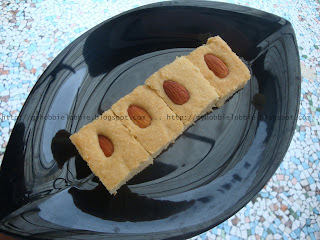 These almond bars look so scrumptious! Glad to have found your blog through the SRC this month. Looks super...sure that it tastes great..
Wowww... Looks super delicious.. Yummy !! Those are so cute! I bet they were delicious! I totally love anything with almond in it (as my post for the SRC club would show today too!) :) I'm sure these were very yummy! Thank you all for stopping by and for your kind comments! We can't find almond paste in these parts either unless it's Christmas time, so it's great that you've done all this leg work for me. Now I can make these any time of year. Or maybe that's not great:). So glad you got my blog. I adore these bars and now I really want one! These almond bars sound fabulous. I would be doing the kitchen dance waiting for them too! Great job with SRC this month! Thanks BFB, its nice to know that I'm not the only soul that waits so eagerly for goodies to come out of the oven! Thanks Kelly! Glad to have you here! New to ur space and absolutely love it here..following u.. Do visit me as time permits..
Looks delicious! Glad to be part of SRC with you! Thanks Amy! Same here, its been fun! These almond bars look wonderful! So fun to be in the Secret Recipe Club with you. Thank you Marla, I couldn't agree more! Wow, good for you, making your own almond paste! Awesome.